It’s a natural instinct for children to shake things – rattles, the side of their cot, their heads – all of this shaking gets a reaction. So it only makes sense that they shake your iPhone and iPad. Meet Zoobert, the star of a ‘choose-your-own-adventure’ story for toddlers. By ‘reading’ Zoobert’s Big Day and shake-shake-shaking the phone, toddlers help Zoobert make decisions from deciding what to eat to choosing a mode of transport (rope, parachute or sneeze!). Zoobert’s Big Day is an interactive Story Shaker book that can be ‘read’ again and again with a different outcome each time. Designed for children aged two years and older, it features bright, fun illustrations and Zoobert himself is a goofy, likeable little monster. This is a terrific app for the youngest of iPhone users and has more bells and whistles than the standard flashcard games created for this age group. 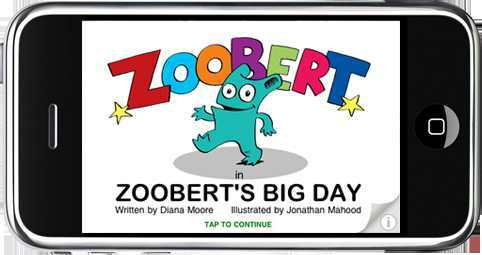 Zoobert’s Big Day is available from the iTunes app store for $1.19 for iPhone and the newly released version for iPad.